Prep the USB drive to become a bootable replacement of a windows installtion CD. ...... After all you can erase your Flash card and format it with you Windows for every day use. 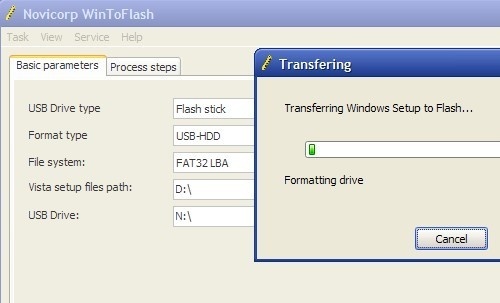 WinToFlash starts a Wizard that will help pull over the contents of a windows installation CD or DVD and prep the USB drive to become a bootable replacement for the optical drive. WinToFlash can alsow do this with your LiveCD. WinToFlash has already garnered recognition throughout the online Windows community as a reliable tool for anyone who needs to install Windows in a hurry. Qweas is providing links to WinToFlash 0.7.0053 as a courtesy, and makes no representations regarding WinToFlash or any other applications or any information related thereto. Any questions, complaints or claims regarding this application WinToFlash 0.7.0053 must be directed to the appropriate software vendor. You may click the publisher link of WinToFlash on the top of this page to get more details about the vendor.